The first contacts between the Taizé Community and the Ecumenical Patriarchate of Constantinople go back to the 1960s. 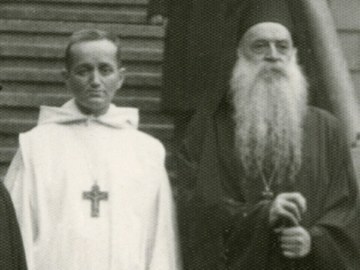 In February 1962, Brother Roger and another brother visited Patriarch Athenagoras in Istanbul. He met the Patriarch again at the celebration of the thousand years foundation of Mount Athos and returned a second time to Istanbul in 1970. In Brother Roger’s room, there is still today an icon of the Mother of God that the Patriarch gave him at that last meeting. In 2005, the year of Brother Roger’s death, Brother Alois in turn went to Istanbul with two other brothers at Christmas to meet with the Ecumenical Patriarch Bartholomew I. The Patriarch welcomed them very warmly and listened attentively to the stories of Brother Roger and his links with Patriarch Athenagoras. He also showed great interest in the youth meetings led by the Taizé Community. As a sign of fellowship, Brother Alois gave him one of the shawls that Brother Roger wore often. In 2011 Patriarch Bartholomew invited Brother Alois to return to Istanbul with a few brothers and 100 young adults.